In the looming shadow of I'll Have Another's absence, it was Union Rags coming along the rail to claim the 2012 Belmont Stakes. Horse racing is a fickle mistress. At one moment you're the favorite to win a crown that hasn't been claimed in over three decades. The next, you're without a spot in the starting gate. You enter the race the expected winner, but finish dead last. And occasionally, you look the certain winner with only a few steps left in the race, and see your horse beat. The last was the scene for jockey Mike Smith and trainer Bob Baffert - not just in today's Belmont Stakes, but in every single Triple Crown race. Their colt Bodemeister was bested in such a manner by I'll Have Another in the Derby and Preakness, and Paynter was tracked down by once Derby favorite Union Rags in Saturday's Belmont Stakes. 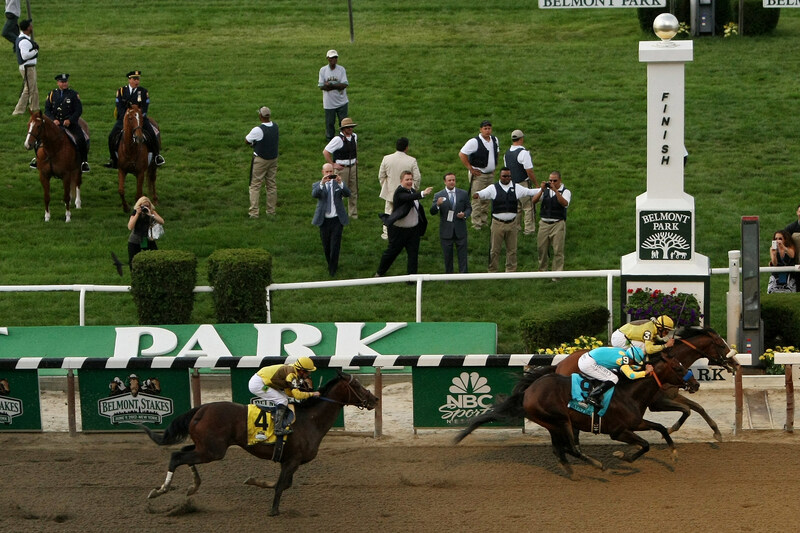 It was Paynter who - like Bodemeister - took the field from the starting gate and held the lead throughout the race. He did so through a rather plotting pace as Smith slowed Paynter down the back - looking to position the horse as one who could survive the mile and a half distance. For much of the stretch, it looked as though Smith had succeeded. Striding down the rail of the Belmont track, Paynter looked to have Union Rags boxed in, and looked poised to turn back the challenge of Atigun. But horse racing is a fickle mistress. And a mile and a half is a long way to run. And in a sport like this, in a race like this, urging your horse with your left hand can be all that is needed to take you from Belmont Champion, to runner up. Smith took to his left in an attempt to urge his horse to the tantalizingly close finish. It caused his horse to veer slightly off the rail, however, giving Union Rags' jockey Johnny Velazquez all the room he needed. Bursting through with a powerful drive, Velazquez did his best Calvin Borel impression, coming along the inside and nipping the wire first. As was the scene in the Preakness, a head was all that separated Smith and Baffert from grade one glory. For the third time, they were second, with Union Rags finally realizing the dynamic promise he'd shown as a two year old. Atigun was third, with co-favorite Dullahan finishing woefully deep in the pack. He'd fallen to the back when the pace slowed in the backstretch, and failed to respond when urged - horse racing, is a fickle mistress. Many will be left wondering what could have been? What if Dullahan had been able to respond. What if I'll Have Another hadn't developed a leg injury. Would we be celebrating a coronation, rather than the type of Belmont Championship we've seen for 34 years? What would this day have been like with the Derby and Preakness winner running, rather than the ever present memory that this day was meant for bigger things? The answers to such questions are better left un-pondered. Let us, instead, celebrate the race that was. One that hung in the balance until the final nod of a head. One that saw a gifted horse position himself as a favorite heading into the sport's summer meets. One that was - if nothing else - grippingly exciting. Yes, we would have all loved to see I'll Have Another run for his spot in history, but who no one can say what would have happened had he ben given that chance. After all. Horse racing is a fickle mistress. Congratulations to Union Rags and his connections.